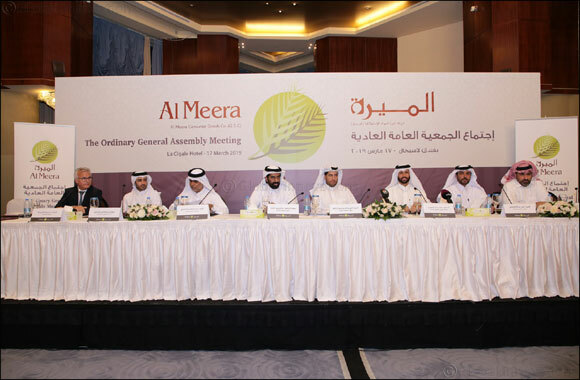 Doha, Qatar, March 18, 2019: Al Meera Consumer Goods Company (Q.S.C) held its Annual Ordinary General Assembly on Sunday, 17th March 2019 at La Cigale Hotel, in the presence of Sheikh Thani Bin Thamer Bin Mohamed Al Thani, Chairman of the Board of Directors, as well as members of the Board of Directors, shareholders and investors. During the year, Group sales increased 4.7% (QAR 134.8 million), from QAR 2.8 billion to QAR 3.0 billion. Its gross profit increased 3.9% (QAR 18.5 million), from QAR 477.9 million to QAR 496.4 million. Group gross shops rental income increased 9.1% (QAR 6.3 million), from QAR 69.5 million to QAR 75.8 million. Al Meera Group’s operating income increased 4.1% (QAR 23.0 million), from QAR 563.7 million to QAR 586.7 million. The Assembly approved the Board of Directors’ proposal on the distribution of cash dividends of 8.5 Qatari Riyals per share. Moreover, the Board of Directors were discharged from liabilities and the Assembly approved their remuneration for the year ended 31st December 2018. In addition, the General Assembly approved the External Auditors Report for the year ended 31st December 2018, and the adoption of the Company's 9th Governance Report and appointing the external auditor for the year 2019 and determining their fee. At the beginning of the Meeting, H.E. Sheikh Thani Bin Thamer Al Thani, Chairman of the Board of Directors, welcomed and thanked His Highness Sheikh Tamim Bin Hamad al Thani, Emir of the State of Qatar and the Father Emir His Highness Sheikh Hamad Bin Khalifa al Thani, on the wise leadership and support as well as H.E. Sheikh Abdullah bin Nasser bin Khalifa Al Thani, Prime Minister, for his direction to all ministries and concerned parties to overcome the difficulties that the company may face. “To accomplish Al Meera’s re-defined Mission and Vision Statements and Brand Positioning, Operations’ target is focused on “Excellence”. To ensure Al Meera is meeting the best possible customer experience, we are reviewing and re-designing 100% of our store layout and planogram with regards to respecting and implementing our daily basic tasks and responsibility to our customers. To ease our customer shopping experience, we are making sure products are assorted in a more convenient way. Staying loyal to its customers, Al Meera has launched an in-house, bespoke loyalty program, Meera Rewards, offering the opportunity to our customers to get rewarded every time they shop at their favorite neighborhood store. Since launch, the Meera Rewards program has been able to register majority of its regular customers into this program. Within a couple of months, more than 149,000 members have joined. Bringing excitement into the program, we have been frequently offering bonus points, targeted promotions and exclusive benefits for the members. Indeed, we plan to assess the success of this program by the middle of 2019; assessment may result in further technical enhancements as well as earn and redeem scheme. Adopting a direct import approach to securing our independency in some key lines, has made it possible for Al Meera to align with Qatar strategic objectives to ensure food supplies continuity and availability (more than 500 products from different origins: Turkey, India, Oman, Macedonia, have been introduced to the Qatar market in 2018). During the year, Al Meera signed MoU to establish a strategic partnership with Tekzen Group, a leading non-food distributor in Turkey, to combine our efforts and leverage our purchases of non-food products. This collaboration has enabled Al Meera to increase its non-food offerings to the Qatar Market. To complement the government’s initiatives to expand its self-sufficiency in local produce, Al Meera has admitted more than 30 SME’s and family businesses to list and display their products in Al Meera stores throughout the whole country, giving these SMEs and family businesses direct and immediate access to our customers to sell their produce. As part of our new initiatives to serve community of all nationalities, we have launched national festivals to strengthen our ties with different communities living in Qatar (Turkish, Indian, Filipino). The development of the new mall in Rawdat Al Hamama is nearing completion and this mall is planned to open for business in the third quarter of 2019. Indeed, the year 2019 will witness the construction of Al Jumailia branch and Al Shamal branch; they will replace the old branches and provide service to customers. In addition to the 10 MAAR convenience stores in Qatar Rail, Al Meera has 20 pieces of land from the Qatar government currently under study and evaluation for future development. Of these 20 pieces of land, Al Meera have started soliciting consulting companies for Design Consultancy and Technical Services for 5 of these sites in 2019. The Group is also assessing the feasibility of leasing various new sites in Qatar, and considering a number of potential acquisition opportunities, which, if executed, will enlarge operations and contribute significantly to future sales. The main expansion objective for 2019 is to increase the selling area of the Group from the current 97,000 m2 to over 100,000 m2 by the end of the year. Al Meera recognizes the existence of opportunities to enhance the fresh section even further; we are tempted to implement a plan to accomplish this; however, the start we have made in one of our branches is under assessment for improvement before adopting a suitable model of managing the fresh in all Al Meera branches. Seemingly, we will revisit the experience of our private label because it has not been assessed as there exist an array of opportunities to increase sales and profit. Therefore, the year 2019 is likely to witness a relaunch of Al Meera private label products, and this will include design, diversity, product range, packaging, and re-branding. We foresee in this an element, which could feed into net profit. Realizing need for attracting young Qatari to join the company, Al Meera is planning to set up a training academy. The purpose of this is two-fold. First, establish a platform to train staff and continue to improve their knowledge and skills to be more effective, efficient and be more customer focused. Second, deliver basic retail training to school students and college students to expose them to retail and energize their interests in business; one day some of these students may join Al Meera and reach executive positions.